Matt Stornetta and Ned Hill created Sonoma Valley winery Water into Wine, which produces District 3 Wine. 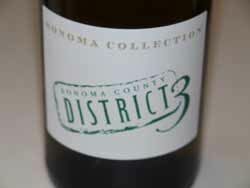 Launched in 2014, District 3 refers to Sonoma and Marin counties, lumped together as one of the 17 different grape growing districts created by the California Department of Food and Agriculture. Ned Hill ownes La Prenda Vineyards Management in Sonoma County and Matt Stornetta is his operations manager. La Prenda farms more than 900 acres of estate vineyard properties for Parmalee-Hill Wines & Vineyards, Rams Gate Winery, Schug Carneros Estate, Nicholson Ranch, Hanna Winery, Roche Winery, Bennett Valley Cellars, Patz & Hall and many others. District 3 grew from the efforts of Stornetta and Hill to help their clients sell your grapes, and taking it a step further, they began releasing their own wines. Matt Stornetta is the winemaker and Alex Beloz is the consulting winemaker. The winery produces about 800 cases of Chardonnay, Pinot Noir and a Red Blend. All wines retail for less than $20 and are available mainly in Northern California.